Meeting Introducing Community to Prospective Park Morton Developers Scheduled for September 4th. | Park View, D.C.
Meeting Introducing Community to Prospective Park Morton Developers Scheduled for September 4th. The DC Housing Authority (DCHA) has scheduled a Park Morton community meeting for Thursday, September 4th, at 6:30 p.m. as part of the community engagement process related to the redevelopment of Park Morton. The meeting will be held in the Bruce-Monroe @ Park View Elementary School auditorium (3560 Warder St., N.W.). The purpose of the community meeting is to introduce the residents of Park Morton and the surrounding community to the development companies that are competing to become the Master Planning and Development Team of the Park Morton redevelopment project. The District of Columbia Housing Authority received four proposals to redevelop Park Morton. In speaking with DCHA directly, the purpose of Thursday’s meeting is for the four development teams to introduce themselves and talk about other projects they have done. The meeting will not include any presentations on their proposals to redevelop Park Morton itself. 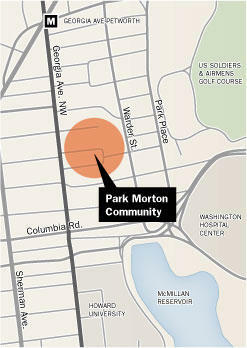 The proposals for redeveloping Park Morton will be the subject of future community meetings. Within DCHA’s announcement (below) of the community meeting, the Agency stated that they estimate that “the Park Morton revitalization will cost more than $100 million.” Furthermore, their goal is to have a development team selected by the end of 2014. This entry was posted on August 29, 2014 at 11:01 am and is filed under Development, Housing. You can subscribe via RSS 2.0 feed to this post's comments. I was a bit confused about the purpose of this meeting so I reached out to Christine Goodman at DCHA to see if there would be any opportunity for the community to view the proposals before a contractor is selected. She said no, this will be the only community meeting before the selection committee makes its decision. If correct, this would mean there will be no opportunity for the community to give feedback on the specific bids before a selection is made. She was also not sure whether the panelists who make the actual selection will even be at the community meeting, so it is really not clear how community input from the meeting will play any role in the selection process.